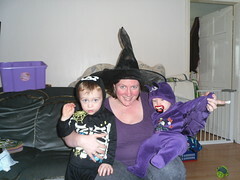 Lets face it, I love an excuse to dress my kids (and me) up! So here's my kids, Jack as a skeleton and Tom as a bat, just before setting off for a party at Stefs (Adam & Conner's dad). I wasn't sure if grown-ups were dressing up or not, so I opted for a black outfit with hat and cape figuring I could lose the accessories if I was the only one. I wasn't though! Yay!!! We had a nice time at the party. Jack got on well with the other kids (made good friends with a little devil) and Tom was ok so long as I holding him (mummys boy, ahhhh) I have a few snaps on flickr of the other kids in their costumes too. We missed the trick-or-treating though coz Mark wanted us home for tea (he was doing the roast) but to be fair I think Jack might still be a bit young and as Tom is already growing out of his 6-9 month bat-suit I'd have worried about him getting cold where the legs gapped. Next year I'll make sure they get to go!